Parts of dotwav were hard to write. Because parts of the novel required me to confront some uncomfortable political truths about the UK. Foremost of those truths was the insidious rise of the far right, and the accompanying nebulous, unjustified fear of immigration that we are bombarded with here on a daily basis from scare headlines in unconscionable, trouble making newspapers, and in sound bites from old-enough-to-know-better right wing talking heads. I wrote dotwav a couple of years ago. Already the feeling of a nation getting ready to pull up the drawbridge of its imaginary castle was becoming impossible to ignore. I envisaged that things were only going to get worse. That our hearts were growing colder and our vision was getting myopic. 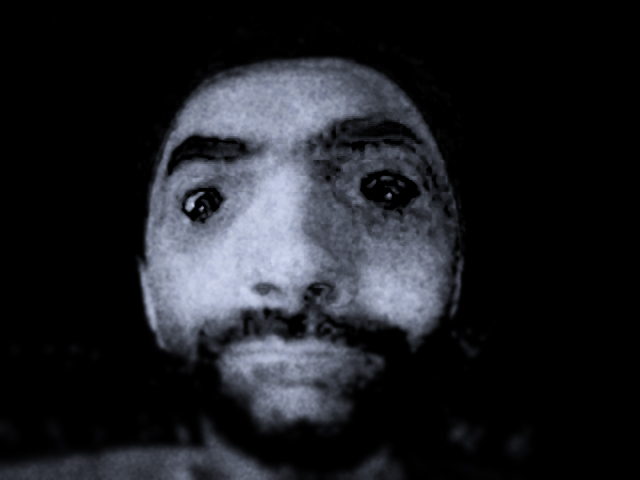 So I extrapolated from what I saw and I built the artifice of dotwav on the bedrock of the growing unease I was feeling, the lurch towards isolationism that I was seeing. What I didn’t see was that we would actually vote to leave the European Union. Because that was just madness, right? The readers’ suspensions of disbelief surely wouldn’t stretch that far, right? A country couldn’t pull out of the great project of Europe in a fit of isolationist, inward-looking, temper, right? People often say that truth is stranger than fiction. I always shake my head at that. But then I have read some very strange fiction. The English and Welsh vote to leave Europe (and my admiration goes out to Scotland and Northern Ireland for resisting the pull) is not stranger than fiction. Because it’s real people this will affect. Not fictional characters. This won’t be resolved in the last chapter. There is no deus ex machina that can save us. We bought into the politics of fear, and we must now face the very real consequences of that purchase. I truly believe that this was an ideological debate (forget the red herrings about immigration and lack of housing, about social security ‘scroungers’ and a stretched health service – those were the products of UK government policies, not the natural by-products of a European superstate) and the two competing ideologies were simple. One looks at the world through fearful eyes, seeing ‘foreigners’ as a threat to our green and pleasant lands; that prefers to look inward at our island nation and imagine it magnified by our ‘show of defiance’ in the face of European integration. The other ideology is that we are all in this together. Regardless of colour, creed, social standing. It is outward-looking; trying to solve humanity’s problems by pulling people together, not by pushing them apart. Personally I am ashamed of my country’s decision to leave the EU. I think that it’s our children, and their children, and their children that will suffer because of it. The great majority of young voters saw through the hyperbolic, fearful rhetoric and put their crosses in the box marked ‘REMAIN’. We let them down, yesterday. We let them down badly. We have basically turned our backs on the European Union because it wasn’t perfect. Well, newsflash: nothing’s perfect. Sometimes ‘good’ is good enough. Sometimes ‘faulty’ will get us through. It’s far better to mend unique things that are malfunctioning; and it seems criminal to just throw them away. Well, we just threw away Europe. We stepped out of a post-war dream, and from where I stand it looks like we just sleep-walked ourselves into the middle of a nightmare. The economic repercussions have already begun, but it’s not the Pound that I fear for, it’s that we chose the door marked ‘fear’ and slammed the door marked ‘together’. We didn’t care what it would do to the European Community, we just slammed the door, locked it, and then tossed a hand grenade over our shoulder as we walked away. I feel lost and angry and afraid and ashamed of my country’s decision. I feel like the politics of fear have sabotaged our move towards a brighter future. I feel like there should be thunder clouds gathering overhead rather than this hot (European) weather we are experiencing. I feel like we traded our hopes, dreams and aspirations for dust. dotwav – spyfi goodness from the pencil of Mike A. Lancaster. So look, I have this little book I’d like to share with you all. Of course by ‘little’ I mean 100.000 words; and by ‘you all’ I mean ‘the whole darned world’. It’s crazy cool and packed full of shiny new things, some of which are so shiny that even I can only look at them through the kind of smoked glass you use for looking at eclipses. It comes out in September, and it’s been a heckuva journey getting here, I can tell you. It has switched publishers –but luckily retained the same superb editor, please take a bow Alison Weiss at Sky Pony Press, without whom this book would probably never have come to light– and it has had two very different design schemes (the Sky Pony one is so awesome that it might technically have to be classed as a weapon of mass distraction). It’s getting some good early reviews (this one at Kirkus gives me tingles), and I’ve just finished the follow-up, so I think it’s time to start trumpeting its arrival with a series of blog posts that will try to explain just how this book came to be: what it’s made from; how I got the idea; how I planned, wrote and executed it; along with some insights into its journey from typescript to published book. As I said it’s been a heckuva journey, and I’ll try to map some its progress for you, just so you can understand it when I say: this book is very important to me, and I really want it to be important to you, too. As soon as you start writing you learn one important thing. Every character you create needs one. Every place you describe — if it doesn’t actually exist — needs one too. As a result, stories eat names. Books eat lots of names. And they have to be good names. Apt names. Fitting names. So, today as I was writing, I needed a new name for a major character. I sat there typing out names, but none of them fit. I deleted and tried again too many times, but for some reason I just couldn’t find one that worked. I started thinking about how, as authors, we ever find names that fit. For the first time in a long while I found myself considering how I come up with the character names I populate my stories with. And I realised that I’m really not sure. Sure, for some particular characters I can reconstruct the precise reason I chose their handles. (Warning: this could become nerdy and borderline crazy.) Kyle Straker, from 0.4/Human.4, got his from a few different sources. A very early (unpublished) novel I wrote had a character called Kyle Saxon, and though the majority of that work has since been junked and has biodegraded back into my mind, the character name kind of stuck with me. I don’t know why it stuck. I guess there was just something pleasing about its structure, its rhythm. So that was the name I had in my mind when I was planning 0.4. But it wasn’t the name I gave him when I started the actual writing. Because my brain changed it at the last possible moment. It substituted ‘Straker’ for ‘Saxon’ when I typed it out the first time. I nodded approval and kept it. It just sounded better to me. And, I realised later, it sounded better because it served another purpose: it referenced a television programme that I had loved when I was about Kyle’s age. Gerry Anderson’s UFO had a character called Commander Edward Straker. Played by the wonderful Ed Bishop, Straker was head of a task force that protected the world from alien invaders. That extra resonance had caused the name change. By the time I’d written the first few chapters, I couldn’t imagine that Kyle could have existed with any other name. Kyle lived in Millgrove, a place that doesn’t exist. The village itself is a slightly manipulated version of somewhere I lived when I was knee high to a mutant grasshopper, and where I went to my infant and junior schools – Brampton, near Huntingdon. The first time I needed to identify it I chose Millgrove, which – for some reason – sounded perfect to me. It wasn’t until I written it a few times that I realised where my brain had dredged it up from. Orson Welles’ radio version of ‘War of the Worlds’. The Martians’ first landing on earth was at Grover’s Mill – a location that the radio play’s author, Howard E. Koch chose by jabbing a pencil into a map. When I came to write the sequel, the sf referencing continued, albeit a little more considered. Peter Vincent seemed the perfect name for my new protagonist, because it was not only a compound of two other great sf characters (Peter Bishop from Fringe, and David Vincent from The Invaders) but provided a link back to the name of the 1st book’s protagonist that was invisible to just about anyone else in the world but me. (I may have dropped the ‘Bishop’ part from Peter’s name, but it was still there for me, silent, and it referenced the actor who played Straker in UFO). These names are easy to track. I know how they came about. Others I’m not so sure about. They resonate for me, sure, but I’m not always certain why or how. It’s enough that they do. It’s why I can never stoop to using a random name generator. There’s something wonderful in the perfect naming of things. Whilst I would never boast that I make up great names, I remain certain that, for whatever strange reasons, they are the right names. The main characters in dotwav are Joe Dyson and Ani Lee. Again they are the perfect names for those characters. I just can’t tell you why. Back when I was 10 my dad was reading the Sunday paper over breakfast. It was the News of the World (long before it shrunk down from a broadsheet with delusions of grandeur to a tabloid size more fitting its trivial populist ravings, and even longer before it got itself wrapped up in the scandal of phone hacking and other reprehensible activities) and it was a huge paper to a kid like me. We were staying at Uncle Roy and Auntie Clare’s house — not a familial aunt and uncle, btw, but rather friends of my parents that somehow gained uncle/aunt status for a brief time, I think they may even have owned a house we rented for a while — and suddenly my dad looked up and held up a page from the paper. That’s probably not the exact ad, but it’s close enough to sub in for the purposes of this dramatic reconstruction of a pivotal moment in my life. Just picture it to scale – a full page in a broadsheet. It looked massive to me. ‘We’re going to see this, boys.’ Dad said, my older brother was there too. On retrospect it was the best thing my dad ever said to me. There was silence as I took in the image. It was a sublime moment in the truest sense of the word: made up, as it was, of equal parts awe, terror and excitement. Of course I didn’t know the word ‘sublime’ at that point in my life, but looking back it’s the only word that really fits. Now, a person would have had to have been living underneath a rock to remain untouched by Jawsmania. I mean in terms of cultural penetration of a Hollywood product, Jaws had no precedents. It was everywhere, it seemed. And I’d read enough about it to know that it was going to be as scary as hell. I’d wanted to see it, even though a part of me shrivelled in terror at the sheer thought of it. Well, long story short, we took a trip out and saw Jaws. It changed me forever. It was the perfect film at the perfect time. Watching Jaws did a lot of things. It concretised my already-dawning love of the macabre, of the weird, of the horrific. 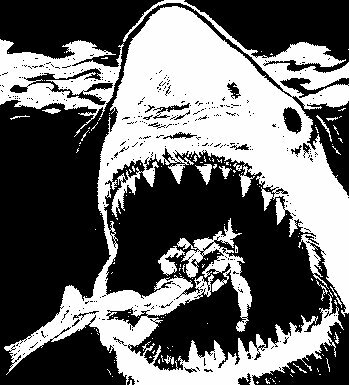 It made me fall in love with monsters – because that’s what Bruce the shark looked like to me: a monster – and it’s a love that abides to this very day. It also filled a bit of me in; provided cogs and gears that had been missing in my brain before I saw it, like my brain hadn’t been functioning quite right up until that moment. I know that may sound a little weird, or pretentious, but I’ll try to explain. I was a quiet, brooding kid, who had imaginary friends. When the imaginary friends went, it was like my imagination didn’t have a focussed place to go. Jaws helped me put my first, tiny, footprint onto the path that I would follow for the rest of my life. To dream out loud, to dream big and in colour. At this point I have to confess that I feel sorry for Mrs Small, my english teacher at the time, who had to suffer through so many Jaws knock-off stories (including the truly awful ‘Fin of Death’ which took up a couple of exercise books), but by way of apology to her I can say this: shark stories were the way I learned to craft stories. Through emulation, then, as I got more confident, innovation. Hone the essential, discard the padding. My shark stories got better. I could feel them getting better. Just like the streamlined fish in Jaws, a story must swim without fat, without anything to slow its progress through water. Jaws let the writer inside me out. Sure, the inputs that fuel my stories may have changed over time. Sure I discovered sf and horror fiction. Sure, the ticking time bomb of my breathless first encounter with the works of H P Lovecraft was still awaiting me in my near future. 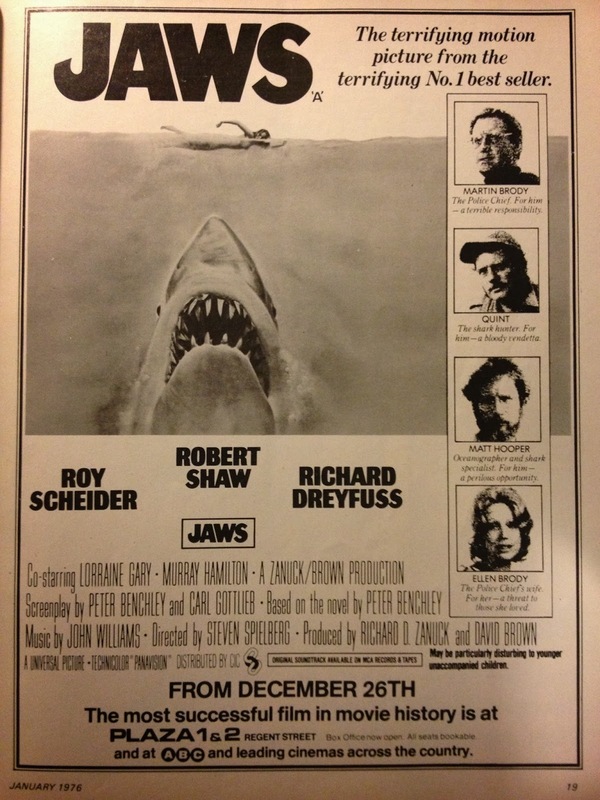 But Jaws was the moment that things fell into place for me. But what could have precipitated this rambling reminiscence? It’s not a bad question. The answer is pretty simple. 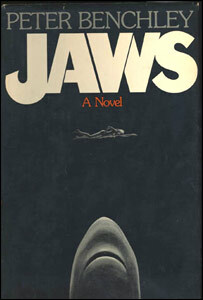 I got my first copy of the novel ‘Jaws’ when I was 11. It was the UK Pan paperback, with a cover that has some similarity to the poster that launched a thousand summer blockbusters. It’s a great cover, better by far than the original US 1st edition that I now also own. 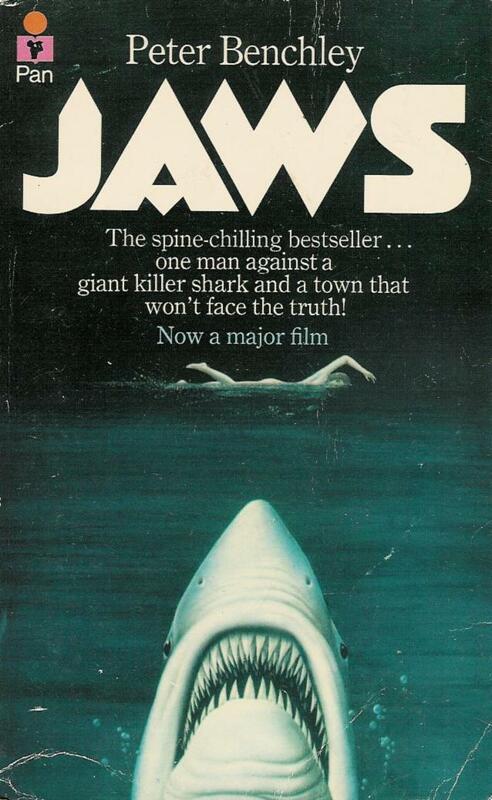 I’ve seen re-release covers and anniversary covers, but I always thought that the original paperback cover was the perfect wrapping for Peter Benchley’s book. Until I saw this the other day. 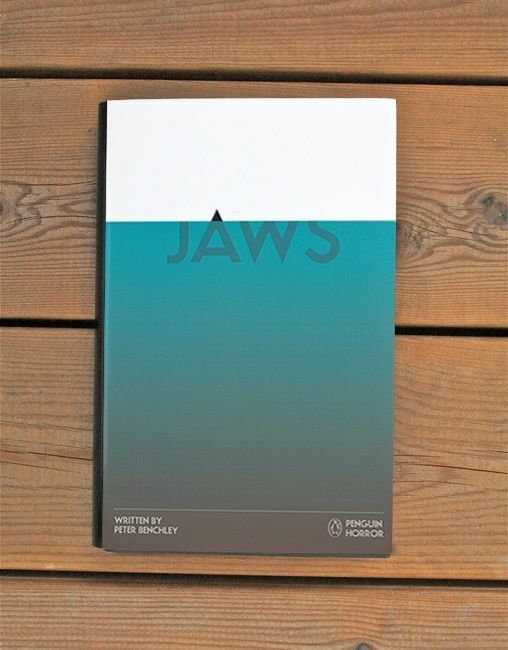 Now that is the perfect Jaws cover. So here I am. New site: new dangers. I got tired of the old site, which had turned less spontaneous, less eclectic, less interesting as time went on. Honestly, the other site kinda hampered me a little. It was a little flat at times. Because it’s only subject, really, was me. And that, in the long run, made me uncomfortable. See, I’m not a science fiction writer, I’m a science fiction fan who somehow got lucky enough to see his stuff printed up in books. My old blog seemed to revolve around the spurious idea that I was – somehow- interesting. Hopefully the work IS interesting, but me – not so much. The MindFeather is different. It’s a hub. Sure I’ll write it, but I will also CURATE it. Make it less about me, more about the work, more about the things I love. News and excerpts and extra content, sure. That’s a given. Reviews and conversations, that would be great. I want The MindFeather to be a digital collection of interesting things. Hope that appeals to you, because it does to me.